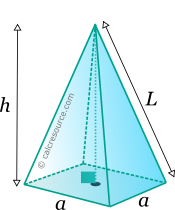 This tool calculates the basic geometric properties of a right pyramid, with a square base. Enter the shape dimensions 'a' and 'h' below. The calculated results will have the same units as your input. Please use consistent units for any input. The pyramid is a solid object with a polygonal base and side faces that converge to a single point, the apex. Typically the most recognizable pyramid is the one with square base. This type is examined in this page. A square based pyramid, has 5 faces, 8 edges and 5 vertices. where \(A_b\) the base area.